The Economic and Financial Crimes Commission, says it has nabbed a 34-year-old man, Anthony Ezechukwu, for allegedly using names of some prominent Nigerian political figures and spouses of others to dupe unsuspecting members of the public. 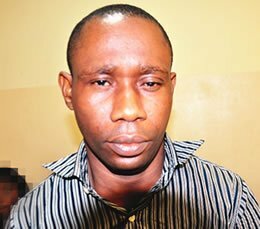 The anti-graft agency said Ezechukwu, a graduate of the Lagos State University, allegedly cloned the Facebook accounts of the Minister of Finance and Coordinating Minister of the Economy, Ngozi Okonjo-Iweala; wife of Lagos State Governor, Abimbola Fashola; wife of the minister of the Federal Capital Territory, Aisha Bala Muhammed; and the Director of the Abuja Geographical Information Systems, Jamilah Tangaza. According to the EFCC spokesman, Wilson Uwujaren, in a statement, the suspect used the accounts to solicit money. He added that the trickery fetched Ezechuckwu thousands of naira. Uwujaren said, “In each of the instances, he devised clever baits to lure his victims. Once he successfully opened a facebook account with the false identity of a Mrs Fashola, he began to send out messages. Soon, requests for friendship flooded his account. “He exploited the frenzy by the unwary Facebook crowd that wanted to be friends with a first lady, by directing some of them to meet with ‘her personal assistant’, who in turn demanded for various sums of money from them in order to connect them with influential people in government and the society. The EFCC spokesman said Ezechukwu’s exploit was discovered after he cloned the facebook account of Tangaza. Uwujaren said despite the poorly constructed message, some persons who were desperate to own land or houses in the FCT fell for it and began to send money into the bank account provided by the suspect on Facebook. It was learnt that Tangaza later got to know about the scam going on in his name and made a complaint to the EFCC.